I am thrilled to be working in conjunction with 11 other blogs to bring you the 2010 Holiday Giveaway Bash next week – November, 8-12 2010! 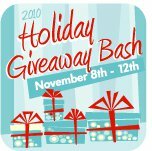 So what is the 2010 Holiday Giveaway Bash? It is going to be a week FULL of awesome giveaways – just in time for the holidays! We have goodies from companies such as LeapFrog, Restaurant.com, LivingSocial, Veggie Tales and MORE. Trust me, you won’t want to miss it! My oldest son, Cooper, loves the Leapster, it is a hit at our house. Also, thanks for the notice of the free collage through Walgreens, I am picking it up tonight. It will be a great holiday gift. Thanks again. I would give this to my daughter. They love leapster products. I would give this to my best friend, who is a struggling single mom to a wonderful 6 year old. this would be a perfect present for her to give to her daughter! This is on the Christmas wish list! My girls would flip out if we won! I would give this to my nieces and nephew for Christmas. My daughter would love this while I homeschool the others!! Already subscribe,posting on Facebook. I would love this Leapfrog product for my special little man! My daughter is wanting this 4 x-mas & I won’t be able 2 afford one this year, so this would be a great blessing!! Luv u’r facebook page 2!! My 3 year old would love this!! Thanks for the chance to win. I have bought stuff on Groupon before….love it! My son would love this Leapster- they make great products. Thanks for the great job you do! I subscribe via email! love the veggies especially Madame Blueberry and StuffMart! I have wanted to buy leapfrog products for my daughter and this would be a great way to get them for her!